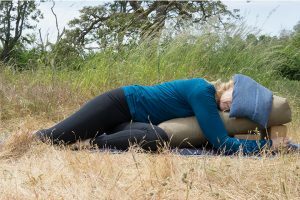 If you have ever seen those yoga sandbags but have wondered how to use them, then in the rest of the video I will show you 10 ways to use yoga sandbags in restorative yoga practice and why you would want to use them. So why would you want to add another yoga prop to your toolbox? Why yoga sandbags? Well they work like the weighted blanket. They simulate deep therapeutic touch, the kind of hands on pressure that relieves the anxiety, tension and stress that accumulates in our bodies. The weight causes the body to produce serotonin and endorphins which our body naturally creates to feel calm and relaxed. They are beneficial for anxiety, restless leg syndrome, PTSD, depression, menopause and premenstrual symptoms. 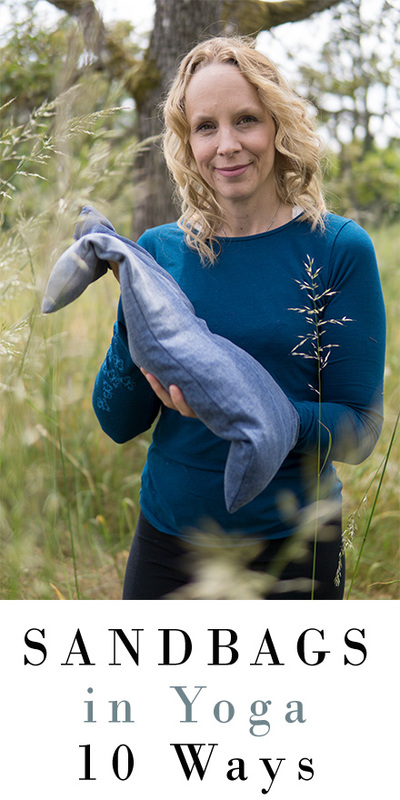 So here are ten ways to use your sandbag in a restorative yoga practice. Place it on your belly in Savasana to move your thoughts out of your head and down into your belly brain. Also to deepen your breath into your belly. Legs Up the Wall can be incredibly grounding through your torso. However, when you place the sandbag on your feet it also becomes grounding through your feet. Tip: use a small sandbag or have a friend place the sandbag on your feet. Child’s Pose: Place the sandbag across your low back to deepen the calming quality of this pose. If you have two sandbags you can place one along the spine, between the shoulderblades as well. Reclined Bound Angle Pose: Help coax the breath down into the lower belly and open up the hips by place the sandbag across the lower pelvis. Reclined Twist: If you have tight shoulders, a sandbag can help to gently coax your tight shoulders towards the ground. A second sandbag can ground you through your hips. Knee up prone: Placing the sandbag on your upper back in prone positions can be like having an acknowledging, compassionate hand affirming your practice. Fish Pose: This can be a great pose to experiment with grounding with the sandbags through your forearms and hands. If you ever feel like you are spinning in circles and are about to float off into space, this is a nice antidote. Psoas release: Placing the sandbag across the psoas in the long bridge deepens the psoas release aiding in that deep emotional release and calm that is possible with psoas releasing. Side Bend: placing the sandbag on your side ribs helps to bring breath awareness to those intercostal muscles on the side body, opening to the three dimensionality of breath. Prone Twist: maybe it is because I have suffered with migraines from years, but I discovered placing that there is nothing quite like the grounding power of placing a sandbag on my head. Try it! You will see. If you made it all the way to the end of this video give yourself a thumbs up and put: “I feel weighed down now” in the comments. I made this sandbag myself, it was super easy, let me know if you would like a video on how to make your own sandbag too.